While economic growth continues and nearly all leading indicators flash green, the shape of the business cycle may be coming into focus. Specifically, economists are becoming more comfortable talking about plausible recession scenarios given the expected path of federal policy. To be clear, the flow of economic data remains healthy, and the risks to the near-term outlook are balanced, if not tilted toward the upside. However, potential danger lurks around the corner with many forecasters pointing at the confluence of events beginning in 2020. At this time, federal fiscal policy will be a drag on economic growth and monetary policy is expected to have transitioned from accommodative, to neutral, and potentially even restrictive. Should this fully come to pass, a recession is likely to follow. However, this outcome is not a foregone conclusion. Rather, for really the first time this cycle, it is a reasonable, and clear scenario for how this expansion ends. Even so, between now and then, economic growth is expected to be at or above potential. 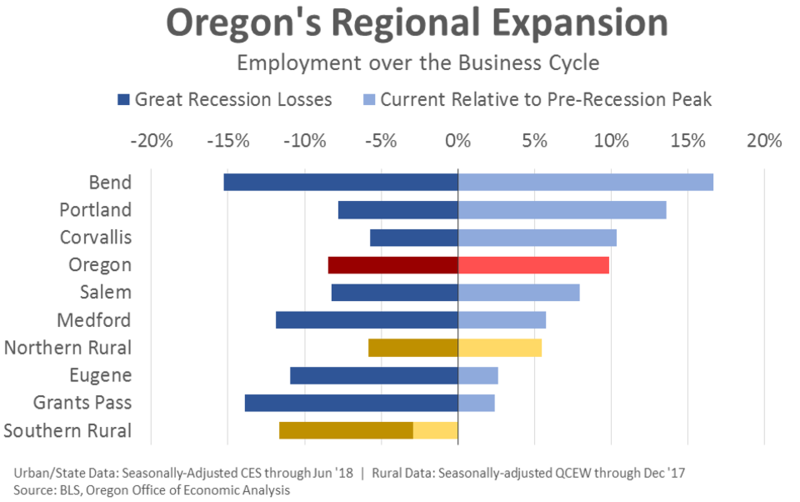 Here in Oregon, the economy follows the U.S. business cycle overall, albeit with more volatility. The good news is job gains are enough to match population growth and absorb the workers coming back into the labor market. Wages are rising faster than in the typical state, as are household incomes. That said, growth is slower today than a few years ago. The regional economy continues to transition down to more sustainable rates. Ongoing improvements in these deeper measures of economic well-being are also expected to continue. Oregon’s economic expansion has largely played out as expected in recent months, yet state revenue collections continue to outpace the forecast. Much of the strong revenue growth can be traced to temporary factors, including the response of Oregonians to federal tax law changes and a spike in estate tax collections. Together with the fleeting nature of recent tax collections, Oregon’s unique kicker law is acting to mute the budgetary impact of unexpected revenues. While more revenue is now expected to be collected during the current biennium, less will be available during the 2019-21 budget period. Although it will take some time for all of the impacts of the federal tax law changes to be known, Oregon’s taxpayers have clearly been responding to the new environment. Since the federal changes were announced, advanced payments of personal income taxes are up 24% relative to last year. Advanced corporate tax payments are up more than 50% over the same period. Although state tax liability has been boosted somewhat in the near term due to the federal reforms, recent payments have been far larger than what could reasonably be expected due to the direct impact of the law changes. It is likely that collections will cool down going forward as households and businesses reconcile their annual tax bills. Should the September forecast come to pass, Oregon’s taxpayers will easily trigger both the personal income tax kicker and corporate kicker laws during the 2017-19 biennium. Both kickers — $686 million for personal, $208 million for corporate – would be the largest dollar amounts seem in more than a decade. However, the regional economy and tax liability are bigger today as the state grows. When measured as a share of tax liability, or a share of tax collections, the projected kickers from 2017-19 are smaller than most historical kickers. The current corporate kicker is largely the result of an expected $245 million in additional revenue as a result of the new federal tax law that requires the repatriation of deferred foreign income. 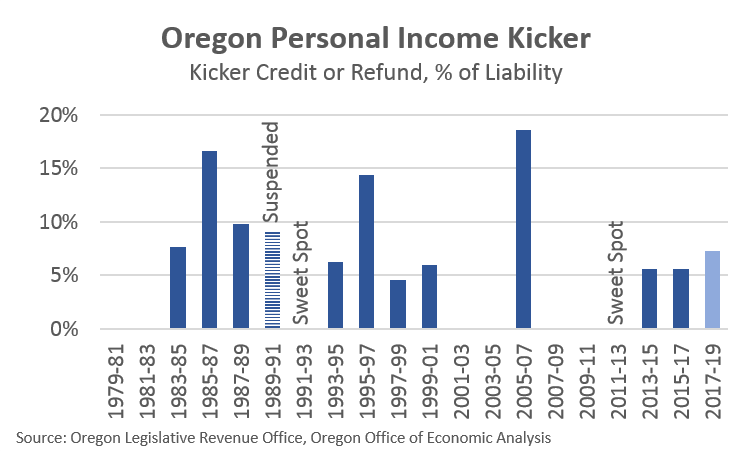 The personal kicker will be paid out as a credit on Oregonian tax returns in April 2020, or right as the economic drags weigh on growth. According to the September forecast, non-corporate General Fund revenues (the personal kicker base) are expected to exceed the Close of Session forecast by 3.7% at the end of the biennium.